THE RED LION ENGLISH PUB & RESTAURANT - Chiang Mai. 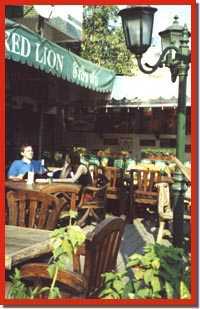 A firm favourite with locals and tourists alike, The Red Lion English Pub & Restaurant features an air-conditioned bar as well as a pleasant terrace over-looking the vibrant Chiangmai Night Bazaar. Now in it's Tenth year, The Red Lion English Pub & Restaurant has quickly established itself as a firm favourite with locals and tourists alike. Ideally located in the heart of the famous Chiang Mai night bazaar in a quiet lane opposite the car-park of Mc Donald's. 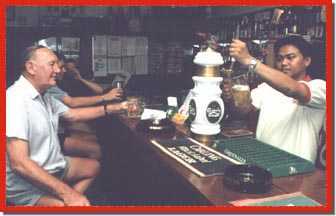 The Pub features an air-conditioned bar as well as a pleasant terrace over-looking the vibrant evening market. The menu includes all the traditional favourites such as Fish �n� Chips with Mushy Peas and Steak & Kidney Pie, as well as succulent Steaks and New Zealand Lamb Chops (served with mint sauce, of course!). We also offer Thai food including Tom Yam Gung, Fried Noodles and Chicken curry. Mikey & Carra (to their mates) have their photo taken with the owner of Red Lion . 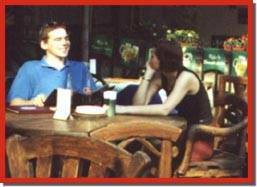 We're very reasonably priced, with most meals priced between 2 and 3 pounds (140 to 210 baht) and draught Heineken at only 100 baht (£1.40) a Pint. 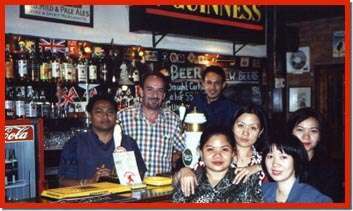 Besides offering Thailand�s Singha and Chang beers and locally brewed Tiger and Heineken, we also offer imported beers such as Strongbow Cider, and Draught Guinness & Kilkenny. Live sports via satellite including Premier League Football, Rugby, and Formula 1 Racing are regularly shown as well as the BBC World News. We also provide a sports Results service with information direct from the internet. We have the widest selection of music in Chiang Mai including Crooners, Country, Rock n Roll, Northern Soul and Folk music. Sorry - no Boy-bands or Rap!! 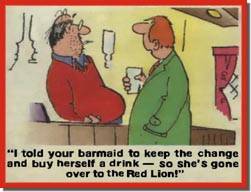 The Red Lion is a family pub that proudly welcomes back many customers from around the world that have come to regard it as their 'home away from home'. As featured in 'Lonely Planet' , 'Frommers', and many more. Open Daily from noon til 1 a.m.
Food served all day . A perfect place to relax after a hard day's trek or a hard night's shopping. The Red Lion and our customers are pleased to offer our help and support to REJOICE.